Although with the similar looks the upcoming Hero IGNITOR looks somewhat like HONDA STUNNER but then also they have certain differences in between them. 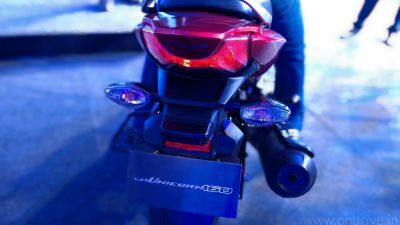 The HONDA STUNNER uses VISCOUS Air Filter whereas the HERO IGNITOR uses the same air Filter as they have used for the HERO HONDA Hunk and CBZ xtereme. The basic advantage of the VISCOUS AIR FILTER is that it provides as hassle free ride and demands a low maintenance on the other hand the air filter of the Hero Corporation needs some maintenance after some time. There is no digital Console for the HONDA STUNNER which provides the trendiest and tough looks as compared to the HERO IGNITOR, having the neat and stylish look. Integrated front body cowl in the HONDA STUNNER provides a muscular look and the same thing lies in the HERO IGNITOR. The major difference in the riding of the STUNNER and IGNITOR is the initial acceleration and pick of the STUNNER and in the battle of pick-up STUNNER wins the field. The initial acceleration of STUNNER is 0-60 in 5.30secs while in IGNITOR it is 6.20 Sec. The electrical system has same in both the bikes i.e. The battery capacity of STUNNER is of 3Ah and of IGNITOR it is of conventional HERO type is also 3Ah. STUNNER and IGNITOR both provides the sporty split seat which is quite popular and attractive in the youngsters. As far as the major technical terms are concerned the basic difference in the both bikes lies in the engine itself. The STUNNER uses the OHC single cylinder while the IGNITOR uses the ATFT technology. As the dimensions of the two vehicles are concerned, there is not such a huge difference. Have a look to the dimension comparison of the two. Exactly i was abt to say dat Hero igniter looks same as Honda Stunner..
will ever come with a 3ah battery when there is self motor deployed.both the byk share same engine so thr wont be much difference in initial pick up’s. copy is copy and original is original. dont hero have any idea to make original bikes. plz tell me if stunner can have kick fixed from market? as it does not have a kick unlike ignitor. so that my decision is pending on which to buy out of the two? thanx. No..exactly same ques comes in my mind as well!! thats why go for hero ignitor!! I am planning to buy one of these. Please suggest me which one would be the better option and why? StuNNiNg performance is oNly STUNNER,, its not an ignitor can CREATIVE!!!!!!!! Bike kharido to sirf only honda stunner. Honda Stunner for better engine. Which one is the best to buy ignitor or stunner? Bhai ignitor ka engin power baad me kam ho jata hai baad me to 100cc se bhi kam pickup leta hai..
Bhai jara sambhal k honda stunner me kick nahi hai kabhi aisa na ho ki battery dead ho jaye ya kahi ladko k pange ladai jhagde ho jaye aur bike me kick na hone se bike chalana mushkil ho jaye. Time ka kuch ni pta honda k kanche engineer ye ni smajte ki bina kick k kabhi b dikkat aa sakti hai. Best mileage bike is Honda..